This week's topic on You're Important To Sara explores Why Fantasy is so Important to Our View on Life. 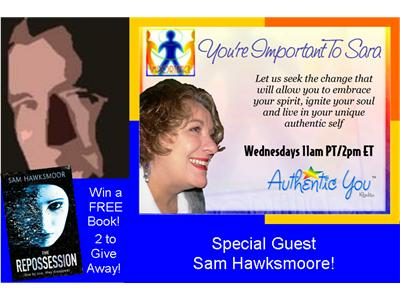 Author Sam Hawksmoore will talk about his book Repossession and the importance of fantasy in our lives, and what drives him to such adventured writings. 2 books will be given away to first 2 callers. Sam Hawksmoor started writing after careers that involved travel, photography and teaching. Add a smattering of gold prospecting in British Columbia, working on radio in Africa, not to mention being a tour guide in America and Europe; he likes to collect people and stories. His heart belongs to Vancouver, a city that is changing so fast the past is disappearing almost before it happens. Sam believes that the 21st Century will be so different to the last, people will look back on our lives now and wonder how it was we could be so primitive. On the other hand... Hawksmoor hopes that you will enjoy The Repossession and stick around for part two, The Hunting, coming out this August.